Which Matters More—High Grades or Challenging Courses? Colleges Want to See High Grades in Challenging Courses, but Which Matters More? A strong academic record is the most important part of nearly all college applications, but there's no simple definition of what makes an academic record "strong." Is it having straight "A"s? Or is it taking the most challenging courses offered at your school? The ideal applicant, of course, earns high grades in challenging courses. A student with a GPA in the "A" range and a transcript filled with AP, IB, dual enrollment, and honors courses will be a contender at even the country's most selective colleges and universities. Indeed, the great majority of students who get into the country's top colleges and top universities have "A" averages and a transcript filled with demanding courses. For the majority of applicants, earning straight "A"s in a slew of demanding courses isn't realistic, and setting goals that aren't achievable can lead to burnout, frustration, and a general disillusionment with education. Take at least a few challenging courses (AP, honors, etc.) in core subjects (math, science, history, English, language). Spread out your AP, dual enrollment, and honors courses over your sophomore, junior, and senior years. Trying to accomplish too much all at once is a recipe for burnout and low grades. Don't set yourself up for failure by taking AP courses in subject areas where you struggle. For example, if you don't have much aptitude for math, choose an AP English Language course, not AP Calculus. Don't give up extracurricular activities you love in an effort to put all of your energy into academics. For one, the best college applicants have interests outside of the classroom. More importantly, you'll be miserable. Keep in mind that many high schools recognize that AP, IB, and honors courses are far more difficult than other courses, and as a result, give weighted grades for those courses. A "B" in an AP course will often be calculated as an "A" or "A-" on a student's transcript. That said, the most selective colleges tend to recalculate applicant GPAs by ignoring courses that aren't in core subject areas, and by converting weighted grades back to unweighted. 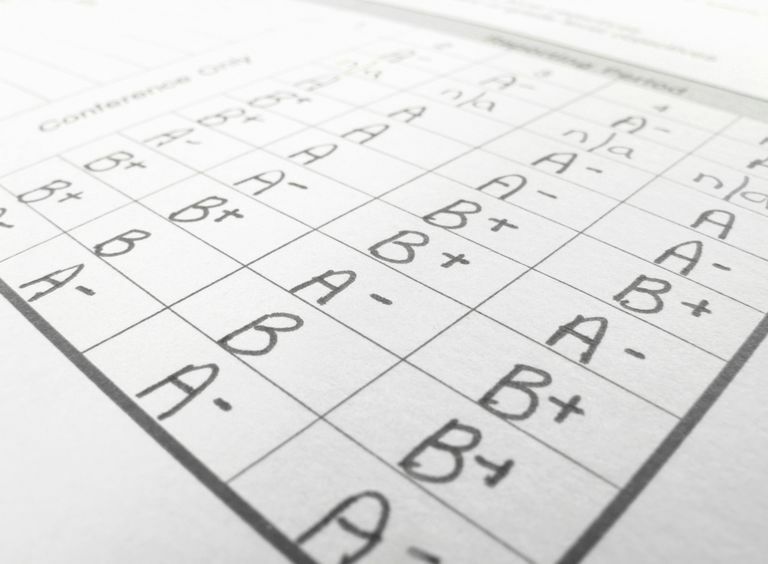 For selective colleges, "C" grades will often close the admissions door. With far more applicants than spaces, selective schools will typically reject applicants who struggle to succeed in difficult courses. Such students will likely struggle in college where the pace is even faster than in high school, and no college wants to have low retention and graduation rates. That said, students with some B grades in difficult courses will still have plenty of college options. A "B" in AP Chemistry shows that you are able to succeed in a challenging college-level class. Indeed, an unweighted "B" in an AP class is a better measure of your ability to succeed in college than an "A" in band or woodworking. This doesn't mean you should avoid band and woodworking (all students should pursue their passions), but from an admissions standpoint, band and woodworking show the breadth of your interests. They don't show that you are prepared for college academics. True, your academic record is going to be the most important piece of your college application unless you are applying to an arts program that gives significant weight to your audition or portfolio. But your transcript is just one part of the application. A good SAT score or ACT score can help make up for a less-than-ideal GPA. Also, extracurricular activities, the admissions essay,​ and letters of recommendation all play a role in the admissions equation at highly selective colleges. Strong extracurricular involvement won't make up for a 1.9 GPA. However, a college may select a student with a 3.3 GPA over one with a 3.8 if that student has demonstrated remarkable talent in sports, music, leadership, or some other area. Colleges are looking for more than smart students. They want students who will contribute to the campus community in meaningful ways. The best advice is to take the most challenging courses available and put in the extra effort to earn high grades. However, don't sacrifice your sanity and extracurricular interests to attempt an overly ambitious academic schedule. Finally, it's important to realize that students don't need to get straight "A"s in tough courses to get into 99% of the colleges in the country. Places like Harvard and Williams are not your typical colleges, and in general, a few "B"s or even a "C" won't destroy your chances of getting into a good college. Also, students who struggle with AP courses would probably find themselves in over their heads at the country's most selective colleges. What GPA and SAT/ACT Scores Do You Need for University of the Pacific?